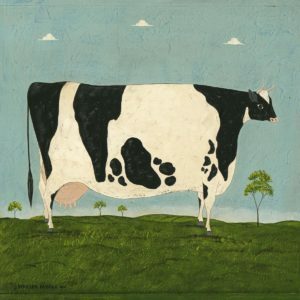 “Vermont Cow,” a classic Warren Kimble painting. 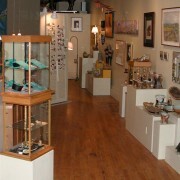 Warren Kimble may be famous for his contemporary folk art – he is touted as “America’s Best Known Living Folk Artist” after all — but since “retiring” (we use the word loosely as Kimble is as active as ever), he has chosen to explore new artistic horizons, adventuring into the realm of the abstract. Trying something new and embracing change are not foreign concepts to Kimble; in fact, change has been the constant in this artist’s incredible career, and a key aspect of his success and fulfillment. “You have to grow in your art — experiment, play, create, and change,” he states. His ardent fans may be familiar with his classic folk art featuring animals, rural landscapes and buildings of Vermont. These scenes grace many a home. But, since retiring in 2006, Kimble has approached new subject matter. “I am reacting to what is going on around me and in the world.” His first series in this new direction was “Widows of War,” a collection of mixed media paintings and sculpture created in response to the Iraq War, with a focus on the toil of war on the wives, mothers, and children whose loved ones leave to fight. The collection toured nationwide. The artist so well-known for Americana, with its evocation of a simpler and less complicated time, used this collection to focus on new aspects of the American experience and American life, a complex and complicated time. The “Widows” paintings are a considerable departure: the works are in black-and-white with dashes of blood red and occasional barbed wire. Following that came “Let The Sun Shine,”a series of abstract paintings reflecting an optimism for the future through the textures, shapes, and color palette that Kimble creates. Kimble has also explored new media. His collections “House of Cards” and “Into the Box” are comprised of open-faced boxes which feature found objects and architectural assemblages. These are more whimsical in nature. Click here to see some of those. Most recently, Kimble has presented “Cosmos,” a series of large-scale, ethereal depictions of Earth. Fans of Carl Sagan will look at these with delight and awe. They inspire quiet pondering of the wonders of our universe. 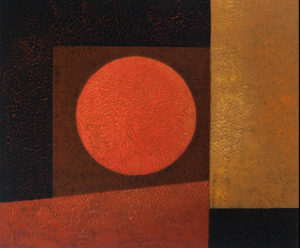 A work from the “Cosmos” series by Warren Kimble. Here’s to the next one. We eagerly await more! 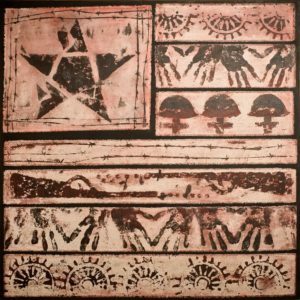 Learn more about Warren Kimble and see more of his art by clicking here.